Home NEWS Thomas Prescher Involved in Sensational Archaeological Project? Thomas Prescher’s Nemo series is inspired by Jules Verne’s 20,000 Leagues Under the Sea and different steampunk and art nouveau influences. To create the second watch of the Nemo series, Thomas Prescher used his Triple Axis Tourbillon watch movement as a base and implemented a new jumping hour indication. The Hours are shown in a framed window. As with most of his dream watches, the final design of The Nemo Captain was born in close cooperation with a proud new owner to make sure that the result corresponds to exactly what his wish was. For the Nemo series important design elements include the porthole look of the front bezels and the back. Nameplates and index rings are inspired by old steam engines and steampunk design. For the Nemo Sailor model, saltwater-resistant bronze was chosen; it has the right look and it ages with time to a wonderful patina. When softly repolished, it gains the charming look of ancient things. Together with stainless Staybright steel a fabulous contrast is created. For the appliqués on the dial and the case, a soft copper found its way into the design. Copper’s warm, red color, together with the traditional font of the letters, round out the design to perfection. For the Nemo Captain non-oxidizing materials were chosen. 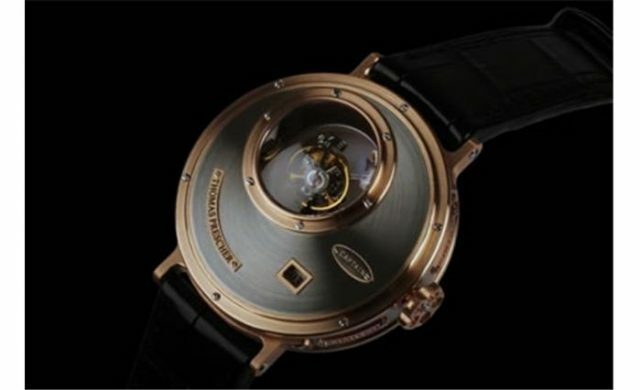 The lugs, front and back bezels of this flagship watch are made from red gold and the middle part from palladium. Not having a dial in a classic sense, red gold was chosen for the appliqués of the Captain: a fabulous combination underscoring a maritime 19th century look.The balance between free space on the “dial” and many little details gives the eye time and peace to recover before starting again to discover the high-end craftsmanship in the finish and the contrast between brushed surfaces and polished chamfers.To accentuate the mesmerizing motion of the Triple Axis Tourbillon, a second small port allows a view of this kinetic sculpture where a sapphire crystal dome catches the eye. Time becomes secondary when observing this motion: a tourbillon on three axes at the same time practically exhausts the imagination of human brain, bringing it to its limit.The case measures 44 mm in diameter and 12 mm in height, while the sapphire crystal dome tops the case by about 4 mm to have a total height of around 16 mm. A really breathtaking detail is the crown, which is inspired by the form of historic valves. As usual Thomas Prescher uses hand-cut and hand-sewn straps made from crocodile leather on both sides. Thomas Prescher makes handmade watches to the very highest standards; their finish is among the best available. So is his service: he offers modifications to client’s wishes for all his models and many existing customers revel in the fact that even their most lavish dreams and wishes can be fulfilled.